So far CFACT Ed has created 1 blog entries. Can oil spills be cleaned up with magnets? Magnets are good for posting up photos and little reminders on your refrigerator. But can they also be used for cleaning up oil spills on our oceans? BY Dr. JAY LEHR: How do shale gas companies get to the milkshake? The Green New Deal was designed to "mobilize every aspect of American society on a scale not seen since World War II.” The entire Republican caucus and three Democrats voted against it. The rest courageously voted "present," including the GND's Senate co-sponsors. Does anyone know whether any Senators voted "present" after the Japanese bombed Pearl Harbor? 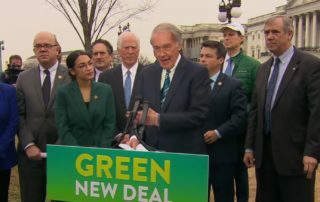 BY CHRIS WHITE: Most Democrats vote "present" following reports suggesting the GND, which seeks to phase out fossil fuel usage within 12 years, could costs tens of trillions of dollars.